The World Animal Day is celebrated every year on October 4th. It was held for the first time in 1929, thanks to the initiative of the World Animal Protection Organization at the Congress that took place in Vienna. To commemorate this date, any species of animal life is celebrated; special events are organized the world over and blessings of many animals are planned in different churches. Diverse events are performed in order to collect funds, expos are promoted and special projects related to animals are summoned at the schools. For Delphinus, dolphins are the heart of the organization, for that reason every day we take the responsibility of addressing our efforts to give them the best of cares. With this objective, we have developed an Animal Welfare Program that covers the needs and specific features of our specimens and the habitats where they live and grow. This program starts by designing a healthy and well balanced diet for every dolphin. This diet covers its caloric and nutritional needs and also its features such as age, genre, development stage and reproductive condition. Our veterinary medicine model is based, first of all, in disease prevention. Every day, our Specialists in Animal Care comply with a review protocol to detect physical or behavioral changes in the dolphins before starting the sessions with the visitors. Different analyses are performed periodically; among them blood tests, stomach contents or mucous in order to identify the primary stages of any disease. It is worth mentioning that the relationship between the dolphins and their caregivers is based on trust and communication. The latter is achieved through a sign language, as well as during the process of “operant conditioning”, which consists in rewarding the dolphin either with food or petting it for his actions and efforts, avoiding at all costs, frustration and punishment. Besides, dolphins also enjoy time for stimulation and interaction with their social group; we offer them materials such as balls, floaters, rubber rings or floating mattresses to play with. With respect to venues, the interaction habitats are safe and adequate not only for its design and international standards, but also for maintaining and optimum quality of the water for the dolphins which is periodically supervised by the Mexican authorities. 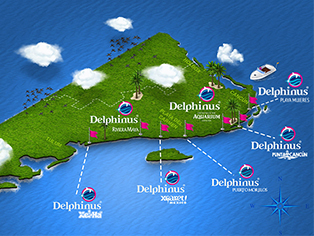 Delphinus has 25 years of experience in marine mammals and has always had the best technology and medications to preserve the health of the animals under its care. We have national and international organizations certificates, as well as alliances with universities and prestigious research centers to learn and share the fashionable techniques and treatments to preserve the health of dolphins. Delphinus is one of the first four institutions the world over – and the first one in Mexico – to have obtained the certification “Humane Conservation™” of the American Humane Association, AHA, thanks to the way it treats its animals through the first world level program devoted exclusively to guarantee the welfare and humanitarian treatment towards the extraordinary animals that are endangered or disappearing and live at zoos or aquariums of the world. At Delphinus we participate in this celebration by working, in order to reach the highest standards of animal welfare for the benefit of the dolphins under our care and to promote among our visitors, respect and consideration for the animal life.